“It doesn’t feel like there are enough hours in the day”. Although that always seems to be the case, what you fill those hours with can either build you up or tear you down. Oh but it’s not that easy, you say. Don’t worry, I hear you!!! With a 2 month old and almost 2 year old, I was drained, overwhelmed, and exhausted at the end of every day. I couldn’t keep up! And that’s when I made “The List”. I wrote a list of things I disliked and wanted to spend less time doing. It included: 1) Picking up toys, 2) Cleaning random “stuff”, 3) Doing dishes, and 4) Feeling tired. Once I had them down on paper it was so much easier to make a plan. I started to tackle each one individually. Whether I was picking up toys or not, I felt like they were invading my household. Toys were in the living room, kitchen, bathrooms, bedrooms, backyard, you get the idea… Why did my children need so many toys? That’s when I remembered a ‘Becoming Minimalist‘ Blog that described all the benefits of owning fewer toys. For the next week, I packed away toys that weren’t within my childrens’ abilities (either too simple or hard), gave away extras, and also “organized” them. This structure included limiting “upstairs” toys and also creating “homes” for different types of toys. Cars, instruments, sports equipment, books, stuffed animals, etc. each toy finally had their own place. On top of it all, I cut the toy count by 50% after all my efforts. I immediately noticed a difference in my son’s playing habits. Suddenly he would spend 45 minutes playing with his wooden blocks. Each toy was getting significantly more play time and I noticed the “simple” toys were quickly becoming favourites. Plus, with everything organized, I was able to start teaching him to put toys back when he was finished. The chore must have seemed less daunting after my decluttering because he caught on! Somehow no matter how much I cleaned, there was always something else that needed to be put away. I decided my cleaning abilities weren’t the issue—we simply had too much “stuff”. Immediately, I started selling or giving away things online. Old clothes, extras shoes, vases, books, knick-knacks, etc. What I couldn’t recycle or give away, I would trash. This task is still ongoing but I’m noticing the change already. I know this isn’t new but minimizing truly does work and it’s almost addicting! (Stay tuned for some other strategies I used to eliminate cleaning). 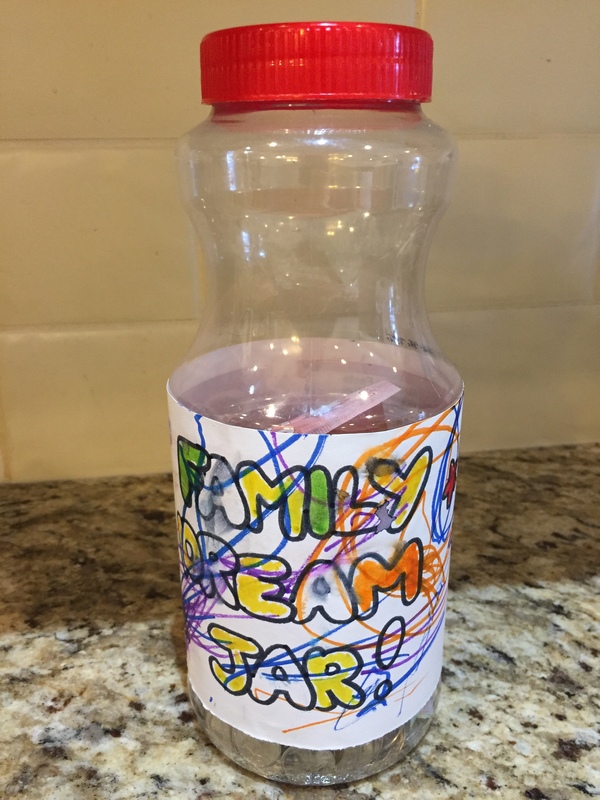 To stay motivated, we also made a “Family Dream Jar” that we put it in the kitchen with a family goal labelled on the outside. All the money we earn from cleaning house goes into it. This has really helped with parting anxiety. 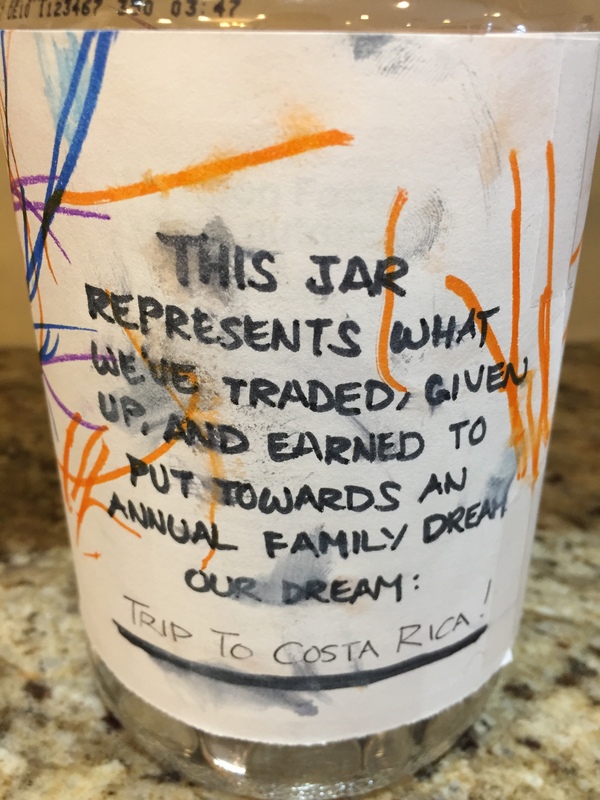 Even if it sells for only a few dollars, it’s encouraging to know the money is being put to better use than an item that’s doing nothing. So far we’ve managed to accumulate over $350 in one month! Rather than making the rounds at night for plastic bowls and snack containers, I’ve taught my 2yr old that if he’s thirsty or wants a snack, he needs to bring me a Tupperware to exchange (there’s normally always one on the loose!) At this point, I can decide to reuse it or put it aside for washing. I have a love-hate relationship with evenings too. It’s nice to finally get the kids in bed but at the same time, I also feel like it’s a countdown until the end of my precious, kid-free time. Even then, when I lie down in bed, I always end up feeling like I jam pack these hours for everything other than me…Who wants to end their day feeling unfulfilled and discouraged? Not me, anymore…. I decided that I needed something to look forward to in the evening—something just for me that I would always put aside time for. I kept it short to make sure it was realistic but I created a routine of having a cup of tea and reading for 30 minutes. Yes, it sounds simple but surprisingly, it’s work to make sure that it happens EVERY night. But you know what, it’s rewarding work and now I always end the day feeling at peace after catching up on a favourite Blog or working on my own. It’s also exciting to pick out teas and look forward to trying them. I’m officially a true believe that going to bed happy automatically starts me off with a positive attitude the next day! Hopefully these tips can somewhat help. And don’t worry, I’m not selling myself short here with only 30 minutes of me time. Stay tuned for Part 2 where I describe some of the other ways I’m carving out time for ME and holding myself accountable.